Cape Town - Kensington Palace has officially announced that Prince Harry and Meghan Markle will tie the knot in May 2018 – but how will the potential future Duchess of Sussex’s modern style have to transform? The adorable couple, who made their first appearance together in September, got engaged earlier this month. Now that Meghan is about to marry into the royal family, surely her fashion sense has to change as well. Meghan, who’s been a Hollywood actress for an incredible 15 years, has already attended numerous red carpet events and public appearances which required her to glam up and carefully plan her looks. The 36-year-old has previously donned form-fitting clothes and hasn’t been shy to showcase her toned yoga legs and fearlessly tries out various designers. But the former Suits actress, who’s been dating Prince Harry for more than a year, has recently steered clear from her usual garments and has followed the Queen’s strict style rules, Cosmopolitan reports. Her Majesty has enforced a “no knees” and shoulders policy when it comes to royal outfits – which is clearly evident in Meghan’s recent style. The UN gender equality advocate has been spotted donning a more conservative look, including an over-the-knee Antonio Berardi dress with an elegant white blazer, which she wore at Prince Harry’s polo event. According to the New York Post, Meghan will also be required to throw on a hat or fascinator for formal occasions – which is apparently a strict must for royals. 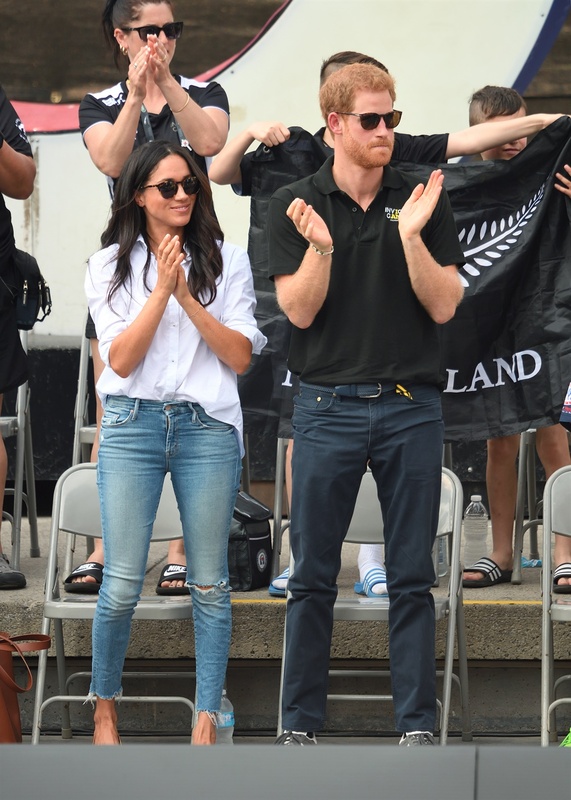 At the Toronto Invictus Games – a multi-sport event created by Prince Harry – Meghan traded in her shorts and flats for a sophisticated trench coat and black skinny jeans combo while walking hand in hand with the Prince. A few days later, she donned a ripped skinny jeans and oversized crisp white shirt – making her style totally relatable. Meghan looks to be the new style icon – even with the Queen’s fashion rules – and fashion guru’s are already wondering which designer she’ll wear on her wedding day next year. One thing’s for sure, we simply can’t wait to see Meghan put her own modern twist on the royal dress code!